We think our corporate health and wellness priorities have helped us win this award from the Washington Business Journal three times. IQ Solutions is focused on creating a workplace that motivates all employees to improve their health. This means offering comprehensive benefits that support wellness—such as health, dental, and disability insurance; generous paid leave and holidays; and an employee assistance program that includes counseling and wellness coaching. Our corporate priority includes actively promoting a healthy lifestyle in and out of the workplace by instituting a company-wide Wellness for Life program. Our Wellness for Life program makes it easy to incorporate healthy habits into the workday. It doesn’t get any easier than attending a free fitness boot camp at our own offices. With different activities every month, the boot camp exposes employees to a variety of exercise choices, from kickboxing, strength training, and Zumba® to barre, Pilates, and yoga. At headquarters we also provide a stress-free center and treadmill workstations where employees can support their well-being on the job. 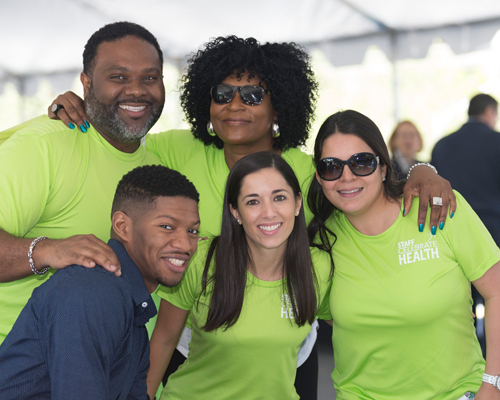 IQ Solutions holds an annual Celebrate Health fair at our headquarters, where staff can join onsite demonstrations, visit with health professionals, and get health screenings. And did we mention a raffle to win prizes such as gym memberships? To help our staff get more fruits and veggies in their diet, we offer cooking classes, fresh fruit in our kitchens on Wednesdays, and special seasonal arrangements with local vendors such as farm markets and food trucks. Out of the office, staff needn’t travel far to participate in corporate-sponsored activities such as a walking program with motivating team contests, a fired-up intramural softball team, and tennis classes. If convenience and fun aren’t enough motivation, Wellness for Life also offers WellSteps, the Wellness Rewards Program that helps staff keep focused on wellness goals. Employees earn points for attending Wellness for Life activities, staying active, and visiting their health care providers for regular checkups. At the end of the year, redeemed points earn a cash reward. There’s even a mobile app to track reward points. Employees can register for the Wellness Rewards Program by sending an email to wellnessforlife@iqsolutions.com. Other financial incentives include partial reimbursement toward gym membership fees and a 50-percent discount on Fitbit for employees who buy the fitness tracking wearable through payroll deductions. Staff can work with a healthy lifestyle coach to develop personalized plans for achieving wellness goals such as weight loss or stress reduction. A new Parents Club fosters a community of support for parents trying to find a balance between their work and family life. We also hold webinars and Lunch & Learn events, and we participate in health observances such as National Heart Health Month and National Public Health Week. We’re always looking for other ways to keep healthy and have fun, so keep an eye out for announcements about activities that pop up, such as ski trips and walkathons.